"Did he just light it to scare us?" Such was the question when the Prophecy's cyno went up and no one came through. "Burn out," ordered the FC. We were in a kiting Omen gang that Diz had put together. "Get range and kill the Prophecy. They should be here soon." So, we shot the Prophecy and waited. If it was to nasty we'd not take the fight. Hopefully it would be a good fight. 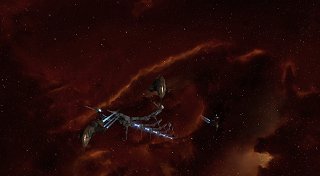 The night before we had killed a Scythe before it could light its cyno to our disappointment. We told them they could try again but they said no. Was this to be our fate? There was some stress over the topic. We burned out and made range. Then ships started coming through. A dribble that increased to a small flood. Tackle, jams, damps, Rokhs, all sorts of stuff. "We can take this!" said DP and we engaged. The kiting Omen is a new thing for me. Lasers are new in general. I like it a lot. Diz has created a swift, agile ship that melts faces off of things. I have an armor cruiser to love finally. Lasers thou. Phew. They are a new game for me. Carefully making sure of my range was important. It was an eleven minute fight. I'd tell you that it was really twenty or thirty. I burned through all of my cap boosters. MWD + Lasers + Manual Piloting. I was at different times damped and pointed and target painted. At one point, we'd lost 2 out of our 3 logistics ships. The Rokh were damped. People jumped a system and reshipped. I was in low armor and warped off only to discover that the system had no repair facilities. Lovely. I bounced back to fleet, saw a Vigil near one of our Celestus and killed it. I got the reps I needed as the logistics hero saved Altaen in 25% structure in his Exequror. We chased things down and killed things. We died and reshipped. They died as well and in the end we held the field as the Rokh's warped out and their last sub-bs got away from us. Damn Atrons. Damn running out of cap boosters. Not bad. Not bad. Plus, we took gateguns the entire fight. The battlefield grid was around 400 kilometers at the end between where we lost the Vexor we were chasing and where the Rokh hit their micro jump drives. The amusing part was the randoms that came through and asked, "What type of gate camp is this?" I felt a moment of pity. Have they never seen a fight before? Were we supposed to scream in panic and run away when the cyno went up? It happened that we had fought this group a short time before a few systems over. I guess they got organized and were comfortable that they were going to neatly counter our fleet comp after the first engagement. http://eve-kill.net/?a=kill_related&kll_id=19544658. We had gone looking for them after we flew through them earlier during the Orca kill detailed below. It was nice that they came back and put it back out there. The deployment is going great and meeting new people to fight is fantastic. Molden Heath can respawn a little bit. The boys are excited and bright eyed. We have fleets planned every few hours. It is a tremendous amount of fun. 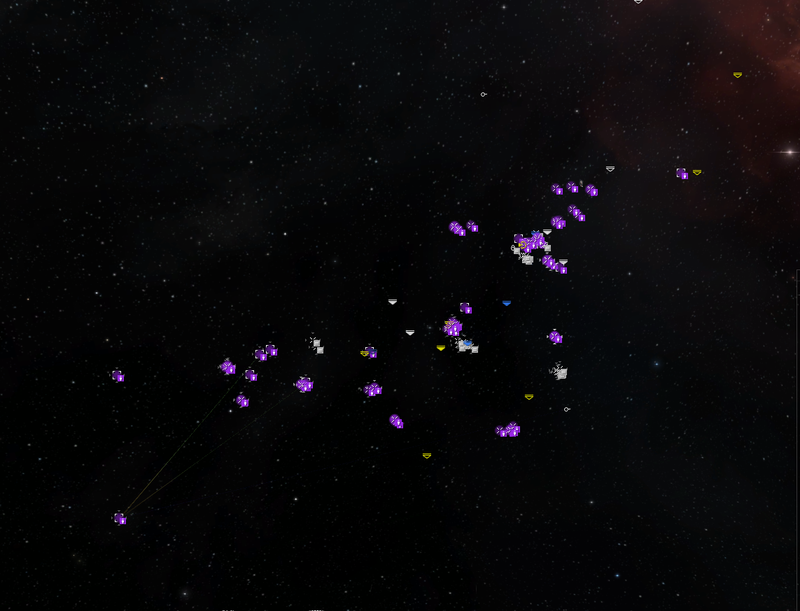 It started with the wave of carriers jumping into our new home station. We handed the current residents a war dec as a way to say hello and make sure that no one was taking station guns for what seems to be endless rounds of station games. Oh yes. I have also trained kill mail whoring to VI. 3D tackled an Orca in a belt and held it for us to bolt 9 jumps. During that time he had a fleet of 5 cruisers land on him while he was sitting on the Orca and warp off without killing his Hurricane. Looks like fun. I'm glad to see that the Omen fit doesn't require AWU5 and such.